The shape editing tool is for editing vector shapes. In Krita versions before 4.0 it would only show up in the docker when you had a vector shape selected. In Krita 4.0, this tool is always visible and has the Shape Properties docker as a part of it. You can access the Edit Shapes tool by clicking on the icon in the toolbox, but you can also access it by pressing Enter when in the Shape Selection tool and having a shape selected that can be most efficiently edited with the edit shapes tool (right now, that’s all shapes but text). As detailed further in the Tool Options, there’s a difference between path shapes and specialized vector shapes that make it easy to have perfect ellipses, rectangles and more. 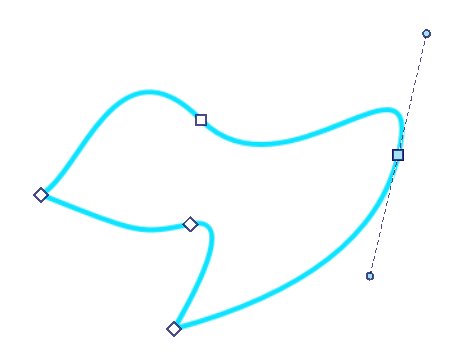 Path shapes can be recognized by the different nodes they have. Paths in Krita are mostly bezier curves, and are made up of nodes. For straight lines, the nodes are connected by a line-segment and that’s it. For curved lines, each node has a side handle to allow curving of that segment using the cubic bezier curve algorithm . What that means, in short, is that moving the side handles into a given direction will make the segment curve in that direction, and the longer the line of the node to the side handle, the stronger the curving. You can select a single node with , they will turn bright green if selected. + Shift on unselected nodes will add them to a selection. + drag will make a selection rectangle. All nodes whose handles are touched by the rectangle will be selected. This combines with + Shift above. You can add and remove side handles from a selected node with + Shift. Krita has several node-types that allow you control the side handles more efficiently. These are the corner, smooth and symmetric modes. Represented by a circle, the corner type allows you to have handles that can point in different directions and have different lengths. Represented by a square, the smooth type will ensure a smooth transition by always pointing the handles into opposite directions, but they can still have different lengths. Represented by a diamond, the symmetric node will force handles to always point in opposite directions and have the same length. + Ctrl on a selected node will cycle between the node-types. Del will remove the selected node. Segments are the lines between nodes. Hovering over a segment will show a dotted line, indicating it can be selected. You can and drag on a segment to curve it to the mouse point. Clicking on different parts of the segment and dragging will curve it differently. Double on a segment will add a node on the segment under the mouse cursor. The new node will be selected. Shapes that aren’t path shapes only have a single type of node: A small diamond like, that changes the specific parameters of that shape on-canvas. For example, you can change the corner radius on rectangles by dragging the nodes, or make the ellipse into a pie-segment. Path shapes have options. The top left options are for converting to different anchor point types. The bottom left options are for adding or removing points. The top right options are for converting the line to different types. The bottom right options are for breaking and joining line segments. The tool options of the Edit Shapes Tool change depending on the type of shape you have selected. With the exception of the path shape, all shapes have a Convert to Path action, which converts said shape to a path shape. Make the selected node a corner or cusp. This means that the side handles can point in different directions and be different lengths. Make the selected node smooth. The two side handles will always point in opposite directions, but their length can be different. Make the selected node smooth. The two side handles will always point in opposite directions, and their length will stay the same. Insert a new node into the middle of the selected segment. Edit line segments between nodes. Make the current segment a straight line. Make the current segment a curve: It’ll add side handles for this segment to the nodes attached to it. Turn the selected node into a sharp corner: This will remove the side handles. Turn the selected node into one that can curve: This will add side handles to the node. Break the path at this point. Break the path at the selected segment. Join two nodes that are only attached on one side with a segment. Merge two nodes into one, if the nodes are adjacent or if both nodes are only attached on one side with a segment. Rectangle shapes are the ones made with the Rectangle Tool. It has extra options to make rounded corners easy. The radius of the y-axis of the corner curve. Ellipse shapes are the ones made with the Ellipse Tool. The type of ellipse shape it is. An arc shape will keep the path open when it isn’t fully circular. A pie shape will add two extra lines to the center when the shape isn’t fully circular, like how one cuts out a piece from a pie. A cord shape will add a straight line between the two ends if the path isn’t fully circular, as if a cord is being strung between the two points. The angle at which the shape starts. The angle at which the shape ends. An action to quickly make the ellipse fully circular.